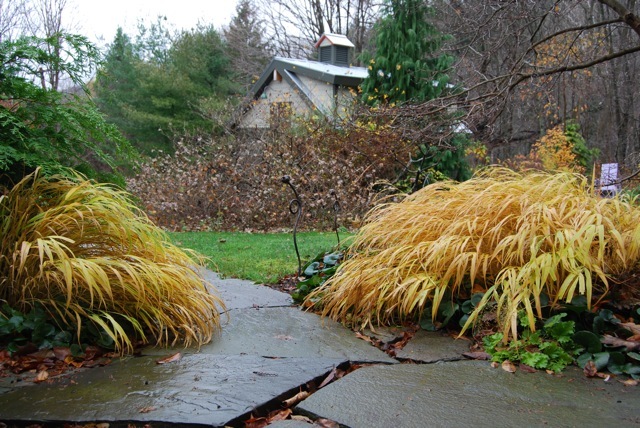 All Gold Grass, Hakonechloa ‘All Gold’, is a new dwarf form of Japanese forest grass that creates an appealing bright spot in the shady or woodland garden. The bamboo-like leaves are bright gold in part sun and more chartreuse in full shade. In the cooler days of autumn, the leaves have a reddish inflorescence. The gracefully arching foliage is slightly more upright than the more common Hakonechloa ‘Aureola’, and does not have the green stripes. This new and an exciting addition to the shade garden ‘All Gold’ displays gold foliage that has a metallic and luminous quality that really stands out. Prefers fertile, moist, well-drained soil. Looks spectacular with blue leaved hostas! I keep nine plants of â€˜All Goldâ€™ (Zones 5-9) overwintered in my vegetable garden for lifting and ordering into summertime duty in pots, where it is also excellent: no care, but all-season color. Thatâ€™s seven of them in a 3-foot bowl in a very shady spot, so less gold and more yellow-green (above). The image is from A Way to Garden. I wish I knew more about planting. They are so beautiful. When should I buy and plant them?